We know how important it is for you to have a good buying experience with us. Your business is important, and we offer professional service for the final stage of the office furniture buying experience. We handle the receiving, delivery and installation as a service to our valued clients. Whether you need one chair assembled and delivered, or 1,000 cubicles installed we got it. Our team has an average of 18 years delivering and installing office furniture. We have experience working with Global, HON, Herman Miller, Steelcase, Haworth, Lacasse, AIS, Knoll, Kimball,Trendway, and many more. We offer our services to clients and as intermarket office furniture installation to dealers locally and nationally. We offer full service delivery and installation. Professionalism and attention to detail is what we pride ourselves on. We have our own trucks, and our own team of experienced installers to handle any project. From home offices to small business, to large corporations no job is too big or too small. Our installers have an average of 15 years experience in the office furniture industry. We take the time to get the job done, and get it done right! Our office furniture Installers have experience working with all the top brands. Their office furniture installation experience includes work with Evolve, Herman Miller, Steel case, Haworth, HON, Global, Friant, AIS, Lacasse, and more. Our shipping and receiving Warehouse is open daily to receive and check in all of your product for your install. 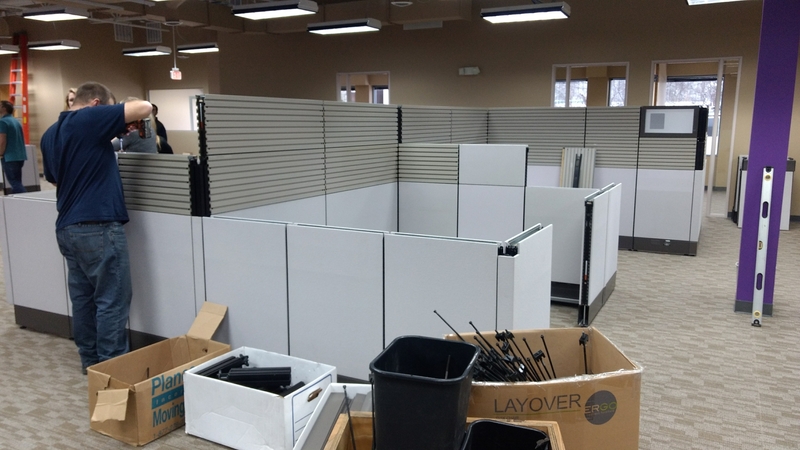 We install cubicles, desks, tables, chairs and more. With multiple crews and trucks we have the capabilities of managing multiple projects simultaneously. We travel well. For our national clients, we travel around the country when the job calls for it. We also utilize our Network of office furniture installation companies to assist. Our experience and commitment to customer service is industry leading. When it comes to installing your office, let us do it for you! Delivery and Installation	Overall rating:	5	out of 5 based on 1	reviews.